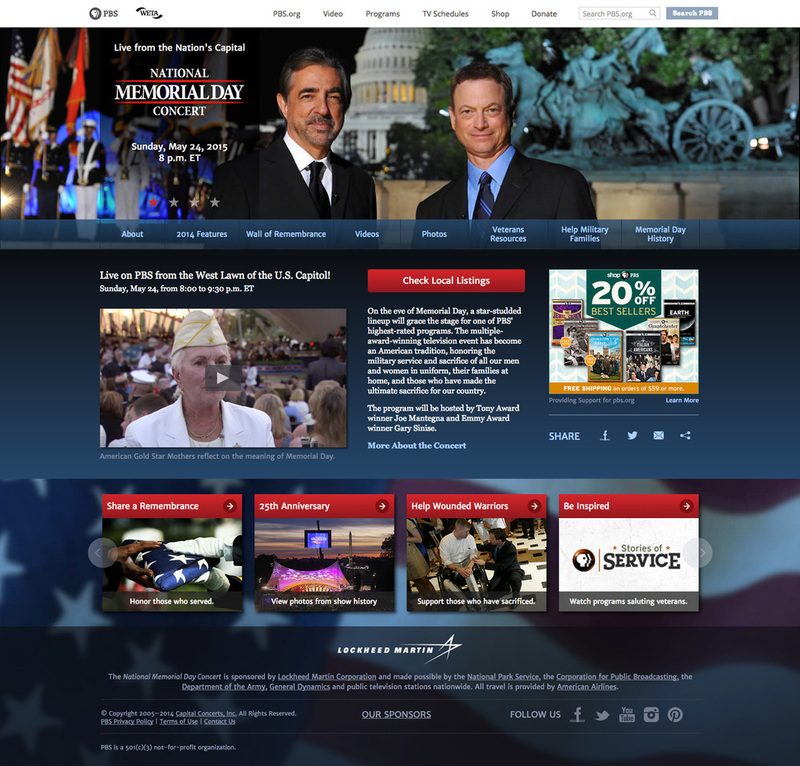 "The National Memorial Day Concert" (NMDC) and "A Capitol Fourth" (ACF) are consistently two of the highest rated broadcast specials on PBS, and the NMDC website draws some of the highest web traffic of any program site on PBS.org. In late 2013 it was decided that the sites needed a complete re-design, and Podium Creative Director Joseph Finneran led that effort as well as overall site production, along with a team from show producer Capital Concerts (CCI), led by Coordinating Producer Jill Jackson. In addition to creating a dramatically more visual, highly interactive upgrade to the previous site, the team was tasked with building the new custom portals on PBS.org hybrid CMS, called “Bento.” While core content was developed with the CCI team, the staff of PBS.org had final sign off on site design and functionality, and site coding and media had to integrate PBS standards and "smart snippets." Project design was completed by the talented team at Kapow in Los Angeles, and both sites went live prior to their related broadcasts in 2014.